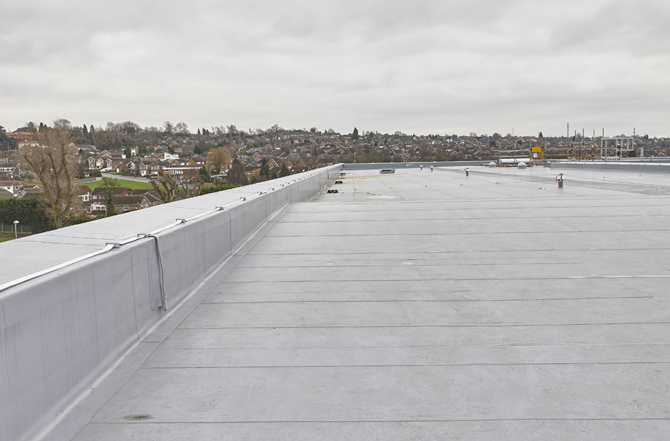 Central to the long-term performance of flat roofs are adequate falls and drainage. The former ensure that rainwater is moved to designated low points, while the latter should be of sufficient size and number to collect and discharge the water in a timely manner. Design failure of these elements is likely to result in ponding, which can stress the roof covering leading to water ingress. Ponding can also increase the dead load resulting in deck deflection or failure, as well as lead to the build-up of dirt, debris and leaves that block outlets and gutters. The design of falls and drainage are covered by BS 6229:2003 and BS EN 12056-3 respectively. 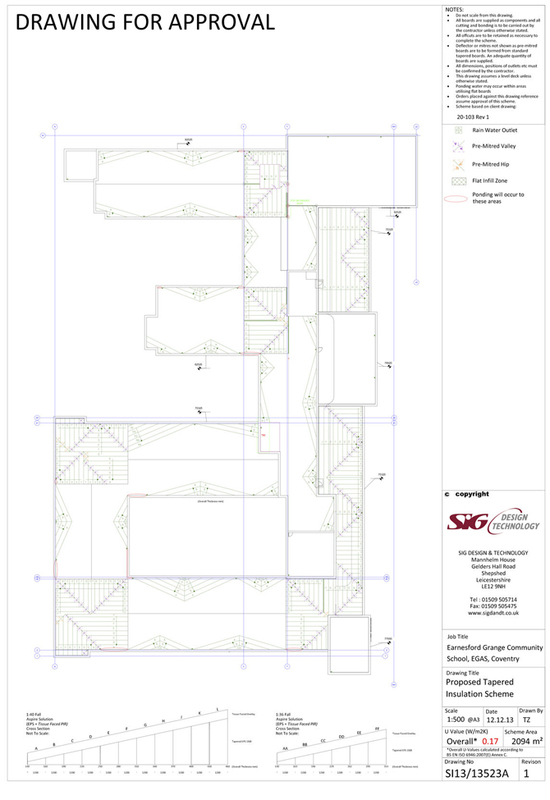 When employing a membrane roof, specifiers should also consult the Single Ply Roofing Association’s Design Guide. 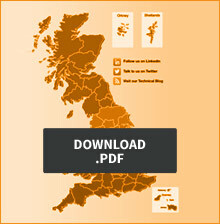 These documents are the ideal starting point for achieving best practice. Early engagement with the project team, roofing manufacturer and installer is also vital to ensure that the proposed falls and drainage work in harmony with the rest of the roof. Falls design, for example, can have a significant impact on parapet upstand heights, door thresholds, outlet and downpipe locations, weep holes, and pipe runs. SIG provides a one-stop approach to design, installation and warranties, which is beneficial for both specifiers and clients. With regards to falls, BS 6229:2003 recommends a minimum of 1:80 achieved falls (for single plymembranes) at any given point along the roof. However, both the British Standards and SIG advise falls of 1:40 to take account of constructional inaccuracies, potential roof deflection and different types of roofing material. Mitre lines must also conform to 1:80 achieved falls where used. Falls can be made using a number of different materials. Firrings are commonly employed on timber roofs and should correspond to the width and length of the joists. Raised or tapered steel purlins can be used on steel structures, while screed is often used in conjunction with concrete decks. Tapered rigid insulation is a popular choice due to its speed and ease of installation. Long runs of falls with tapered insulation should be avoided as they can result in deep build-ups with knock-on effects for upstand heights and door thresholds. Specifiers should also set a minimum target U-value (rather than an average figure) to ensure that rooms or apartments at the end of the falls run have enough insulation. Flat roof drainage can be divided into two principal approaches: gravity or syphonic. The former is generally used on small and medium-sized projects, while the latter is best suited to large buildings, including warehouses, factories and schools. Among the benefits of syphonic systems are fewer rainwater outlets, smaller bore pipes, and horizontal pipework at high level which can help with internal head room. Guidance covering the size of gutters and downpipes, as well as the number and position of rainwater outlets is contained in BS EN 12056-3. The calculation categories, which are based on expected rainfall, range from one (minimum) to four (maximum) in terms of risk aversion. Specifiers should be mindful not to over engineer flat roof drainage systems in this respect. A roof with too many outlets, for example, may not adequately ‘self-cleanse’ due to reduced water flow in the downpipes. The inability to eject debris in this way can lead to blockages and subsequent ponding. Gutters should not only be correctly sized, but also installed to the same falls as the roof, and with a smooth transition from the roof surface. Welted drips should provide a minimum of 50mm cover flashing. One of main benefits of conventional dropped roof gutters is that they collect rainwater in a defined location. However, they also can pose a risk due to their reliance on additional joints, changes of level and jointed connections between different components. The alternative, which is preferred by the Single Ply Roofing Association, is to avoid dropped gutters if possible, utilising tapered and mitred falls direct to the outlet locations. In our experience, architects tend to design box gutters that are too small, making it difficult for roofing contractors to install and dress outlet flanges. This can lead to problems further down the line with regards to water ingress and drainage flows. 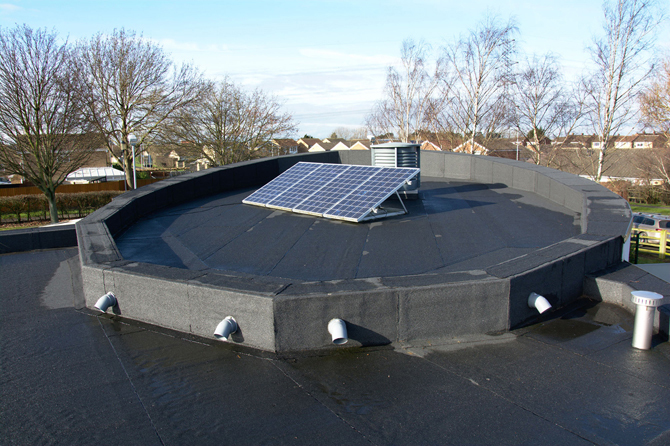 Flat roofs and their accompanying drainage systems should always be installed by credible and experienced contractors. SIG Design and Technology will only supply its roofing systems to accredited installers who have passed the relevant product-related and approved training courses. SIG field technicians inspect roofing installations at regular intervals during construction, resulting in a comprehensive manufacturer guarantee at the end of the process. The latter includes recommended guidance for future maintenance. Flat roofs should be inspected at least twice a year – more if they are surrounded by trees – in order to clear debris and maintain upkeep. As such, specifiers must ensure that roof decks, gutters and downpipes can be accessed safely and easily. For more articles like this sign up to the SIG Design and Technology Blog or contact us via the website. This article originally appeared in Architecture Today. 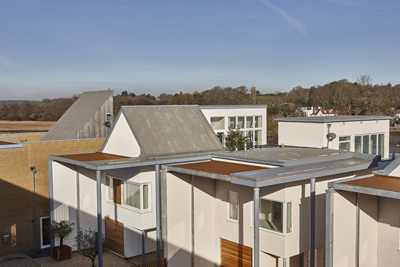 Flat roofing has something of a stigma – it brings to mind leakages and poorly laid felt, however when it’s properly designed an adheres to these brilliant guidelines, there’s no reason why it can’t be as watertight as any other type of roofing. Measurement, far more than the material used, is the most important part of laying a flat roof. Clients should never let cost cut corners, as they will come to regret it with heavier maintenance costs in the future. Excellent article SIG team.. and Sarah is right in the previous comment Flat roofing does have a stigma around it. But to be honest most of the guttering work we do at https://www.leinsterguttering.ie is done on flat roofs commercial and domestic. But again, great take away from this article its been hugely beneficial. Thanks! One of the most critical factors of a roof is its draining system. If water cannot drain off in a reasonable time, then the chances increase for roof leaks. It’s a better option to take a proactive stance and use a product like Liquid EPDM Rubber to handle roof leaks while they are still relatively minor. Thanks for the great post. People and businesses don’t actually realise how important roof drainage is. And not only roof drainage but good roof drainage. The systems with this article are great and pretty much the correct way to do it. We at https://www.roofersdublin.ie completely agree and will defiantly be pointing customers for roofing jobs and gutters here and recommend giving it a read.